Twist, shake and toss. Leafy greens get a lift with the Salad Zinger—a new way to make your own delicious dressing at home. For salad lovers (and even those who aren’t), lettuce is about to get a lot more interesting. From Josh Lefkovitz, the founder of Zing Anything, comes a fresh alternative to store-bought dressings full of artificial flavors and colors. Just like the Aqua Zinger and Citrus Zinger that came before it, the Salad Zinger is designed to deliver full-bodied taste, not a mouthful of artificial stuff. Simply add your choice of herbs and vegetables to the bottom compartment (garlic, onion, citrus, spices, or even fruit) and twist to pulverize. Then, pour in the oil and vinegar, shake vigorously, and enjoy. Create subtle flavors in just minutes or achieve stronger, more intense Zings by allowing pulverized ingredients to marinate in the grind cup for a few hours. Homemade Caesar salad, citrus vinaigrette, peach balsamic dressing—you name it, you can create it with the Salad Zinger. Also great for marinades and sauces. Add some Zing to just about anything. 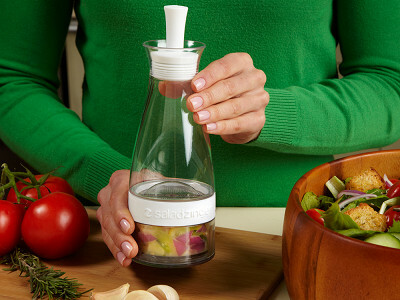 The Salad Zinger is an essential tool for making great tasting homemade salad dressings that are silky, smooth and with a little Zing! Are there any recipes packaged with it? There are some recipes that come with the product, but often times our community members share their own delicious recipes on this board here. If anyone has any good ones, please post. There is a chef developed recipe guide included in every Zinger. I believe about 10 recipes. We also have many more classic and basic recipes located on our website in the recipe center! Glad to help on any and all questions, just let me know! 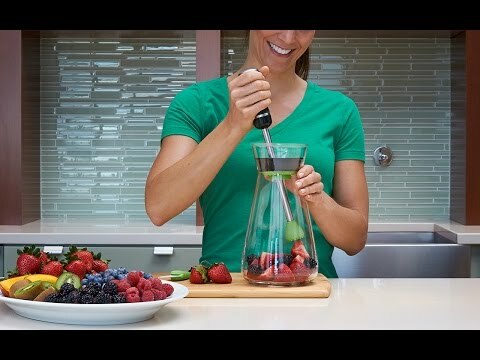 I only make fresh salad dressings and your invention looks really interesting. Can the cup be rotated back and forth for varying degrees of pulverization? What about the length of time the acidic ingredients are in contact with the metal blades? This is a good question and Joshua will likely have the best answer. He will be along shortly to answer your question. Great questions. The bottom cup twists on and off to create the shop. A continuous spin does not happen and would difficult to keep leak proof! However, you can also turn the top blades manually by hand before twisting the bottom cup on to the cruet. Which does help to give a good chop as well. As far as the blades, they are food grade safe 18/8 stainless steel, so they will not be affected by the acidic ingredients. Can you store unused dressings in refrigerator? If so, for how long? Absolutely! We recommend that all mixtures stay in the fridge at all times unless being used. The oil will congeal, but just set the dressing out well a little while before dinner to come back to normal. After 5 days, we recommend discarding the dressing, cleaning (in the dishwasher) and then it is ready for a new Zing! How easy is the zinger to clean? Hi Simon. Cleaning is easy - it comes apart easily and is safe to put on the top rack of your dishwasher or can be cleaned by hand. I just don't understand why someone would need this. Store bought salad dressing is not an option so just use your knife and cutting board, mix olive oil, your choice of vinegar, salt, pepper, herbs and shake in a great Mason jar....free. 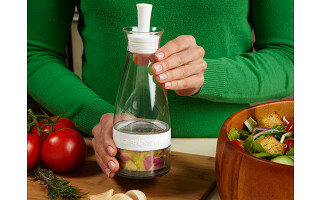 This is a dressing infuser, which actually infuses the flavors into the liquid that's being mixed in - rather than just mixing together. It's slightly different than plain mixing, but it makes all the difference. Twist, shake and toss. Leafy greens get a lift with the Salad Zinger—a new way to make your own delicious dressing at home. For salad lovers (and even those who aren’t), lettuce is about to get a lot more interesting. From Josh Lefkovitz, the founder of Zing Anything, comes a fresh alternative to store-bought dressings full of artificial flavors and colors. Just like the Aqua Zinger and Citrus Zinger that came before it, the Salad Zinger is designed to deliver full-bodied taste, not a mouthful of artificial stuff.